India’s North East Frontier Area (NEFA) [see map] is bordered by Bhutan, China, Myanmar and Bangladesh and is connected to the rest of India only by a narrow 20km wide corridor. 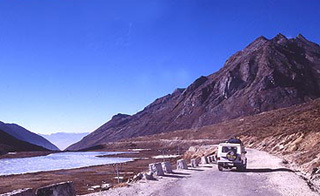 Arunachal Pradesh is North East India’s largest and most remote state. 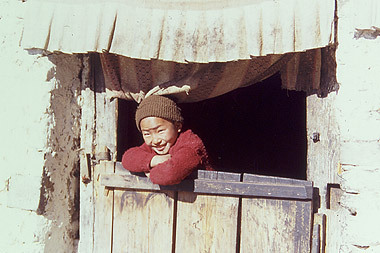 It has a great diversity of tribal people who speak over 60 dialects. In 1999 I was fortunate enough to be part of the second group of americans to ever visit some of its more remote regions. 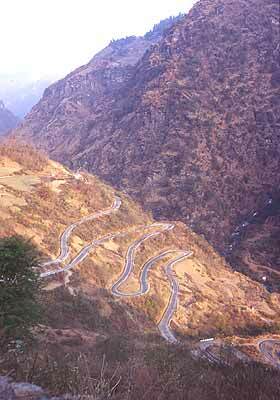 This is the road that we took up into the Himalayas on our way to Arunachal Pradesh. There were no roads into this region prior to the 1950s and the tribal groups that lived here were more less independent. Then China invaded and briefly occupied the territory. After the Chinese withdrew the Indian government starting building roads in order to supply their troops. 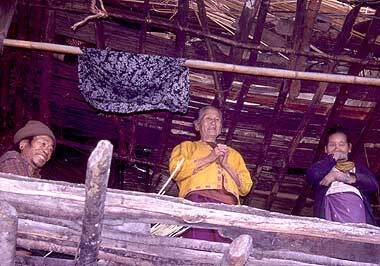 This, of course, was the end of any independence that the tribal people had. There are stories of them trying to resist by shooting arrows at army helicopters. run off the ends of the hat. The Nishi highlanders still hunt with bows and arrows and carry swords. 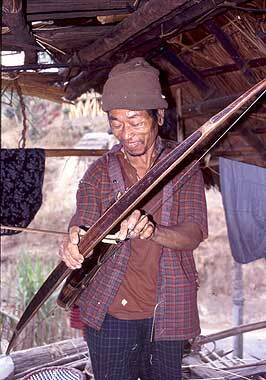 They have traditionally raided the lowland villages of the Apatani tribe. the point home, the sign was shot full of arrows. 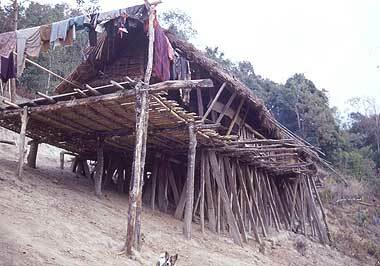 houses on stilts to keep the floor level on the hillside. Inside the house a man shows off his bow. 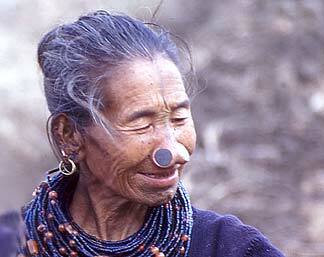 The Apatani women pierce their noses and wear huge nose plugs. men who use to raid their villages. Others say that it was just a tribal custom. 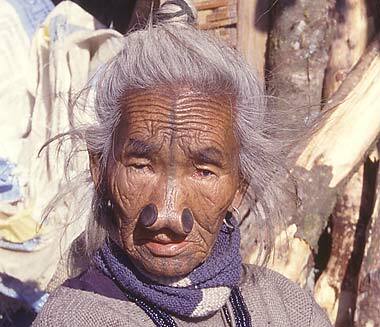 Whatever the truth is, young Apatani girls are no longer following this tradition. 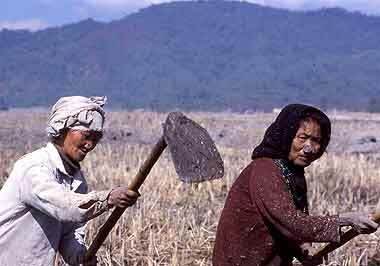 Apatani women tend to the fields. 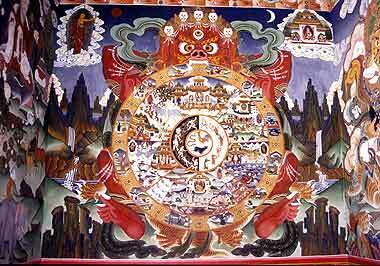 A wall mural inside Tawang Monastery.